THIS POST MAY CONTAIN AFFILIATE LINKS. If you use one of these links, I may earn a small commission at no extra cost to you. PLEASE READ MY DISCLOSURE and PRIVACY pages FOR MORE INFO. Are you planning 3 days in Madrid for your upcoming trip to Spain? Of course, you want to put together the best Madrid itinerary for an unforgettable visit! 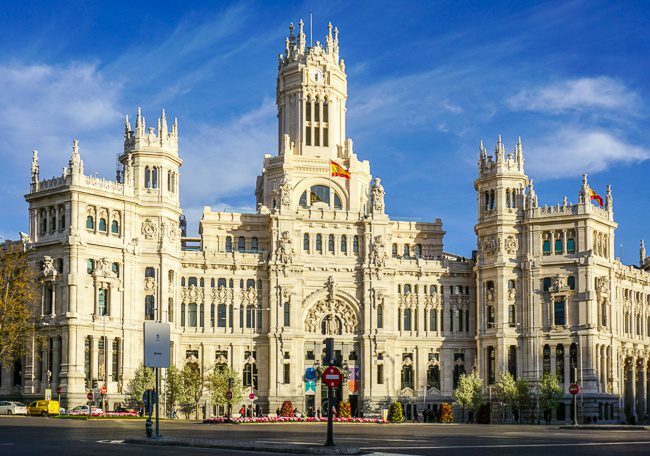 how to position your time in Madrid within your larger Spain itinerary. Save this guide for later. Pin it! 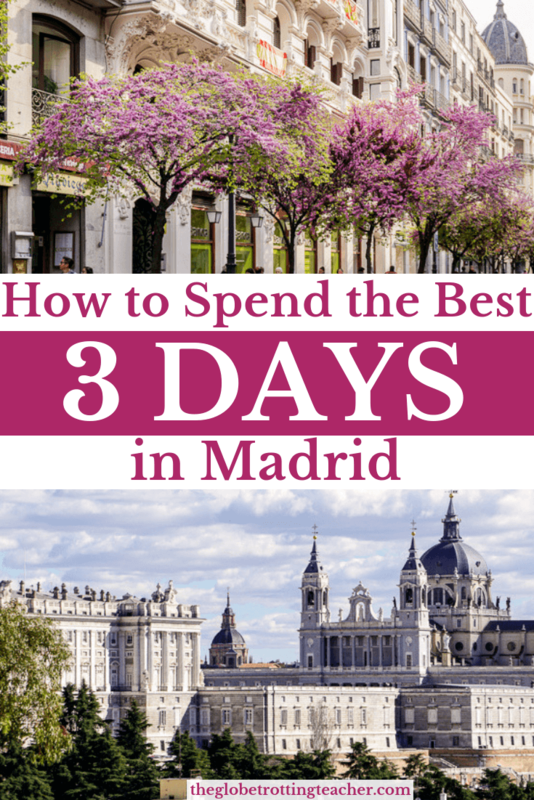 This Madrid itinerary in 3 days details exactly how to make the most of your time in Madrid. To clearly explain the logistics of how it worked for me, I checked out of my hotel on the morning of the 3rd day. The hotel stored my bag while I spent the full day in Madrid. In the early evening, I took a high-speed train to Barcelona and arrived just 2 1/2 hours later. Traveling in the evenings is a great schedule layout for your Spain itinerary if you’d rather not use chunks of your days transiting between cities. Madrid’s Barajas Airport is about 12 miles from the city center of Madrid. The airport is well-connected with a variety of transfer options into the city depending on your travel style and budget. If you’d like a private car transfer from the airport, pre-book a car for the smoothest experience rather than take your chances at the taxi queue. Taxis are supposed to charge a fixed 30€ price for rides from the airport but can often come with unexpected or misunderstood fees. 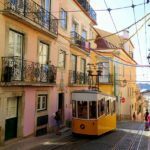 Add to this the challenge of a potential language barrier and the need for Euros because of an “out of order” credit card machine and you have a frustrating start to your trip. Madrid Airport also has public transportation options, too. A 24-hour Airport Express Bus runs every day of the week and costs 5€. The bus stops at T1, T2, or T4 and you can purchase a ticket in cash once you board. The ride to Madrid takes about 40 minutes with the bus making 3 stops after leaving the airport, O’Donnell, Cibeles, and Atocha. From here, you’d transfer to the metro to reach your final destination. The bus only stops at Atocha during the day up until 11:30 p.m, but when it does, it has train connections and a taxi queue to connect you with where you need to go. The Airport Express bus runs every 15-20 minutes between 6 a.m. and 11:30 p.m. In between these hours, expect a bus every 35 minutes. Travelers can also take the Metro into Madrid. From T2 and T4 at the airport, Line 8 goes to the Nuevos Ministerios stop in the north section of Madrid. Metro Lines 6 & 10 connect with this station, which will give you access to additional transfer points depending on which station is closest to your hotel. Taking the Metro from the airport is fast and cheap, at only 5€ for the 12-minute ride to Nuevos Ministerios. 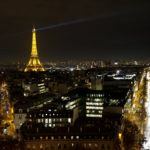 However, if your arrival is between 2 a.m. – 6 a.m, the Metro will be closed. Consider pre-booking a transfer or taking the Airport Express bus. 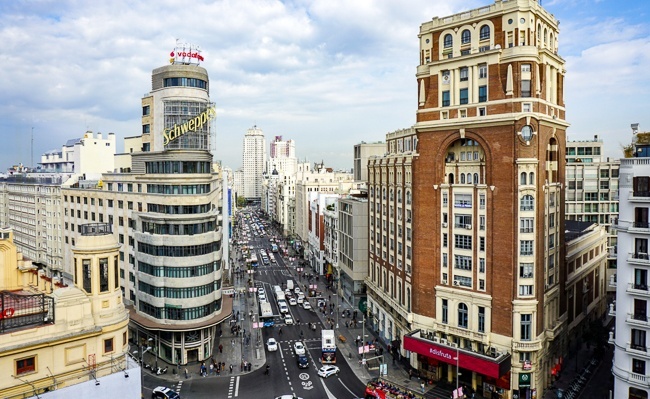 Most first-time visitors to Madrid stay in and around the Puerta del Sol and Plaza Mayor areas. 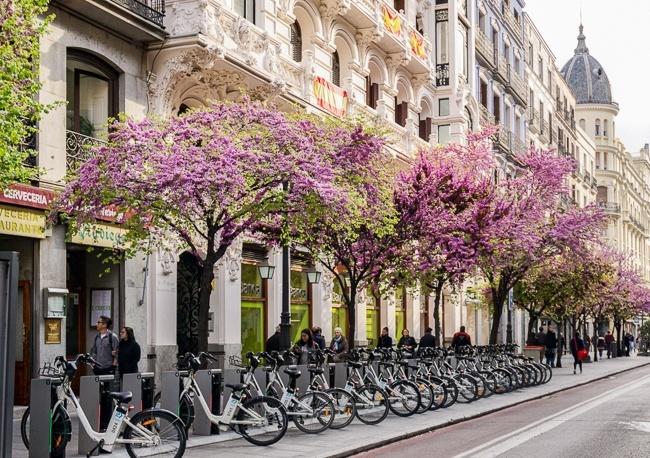 These popular squares are central to many top things to do in Madrid and within a 5-minute walking distance from one another. Puerta del Sol also has a metro station to access other areas of the city. 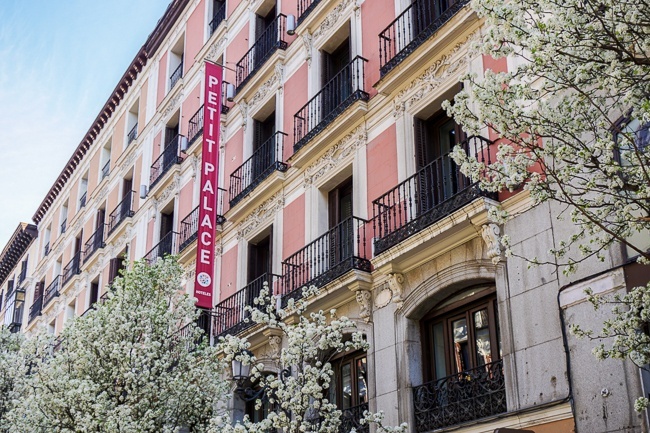 I stayed at the Petit Palace Opera, situated just steps from Puerta del Sol along the pedestrian street of Calle del Arenal. As luck would have it, the hotel is also in (dangerous) proximity to San Gines and their famous chocolate and churros. The hotel had comfortable beds with white linens and towels. They easily accommodated 3 people with 3 twin beds in the room, which can be tricky to find in Europe with smaller room sizes. The room had a safe and a mini-fridge, as well as back and front open-air ventilation via a window and a balcony door. The front balcony opened up to the street which was a bit noisy at first but settled down at a fairly reasonable hour for a weeknight. A full breakfast was included with the rate. There were eggs, meats, cheeses, cereals, fruits, and even green shots made from spinach and apples to give you a boost for the day. At the end of our stay, the hotel happily stored our luggage for the day while we explored more of Madrid and waited for our train later that evening. Check current hotel prices. 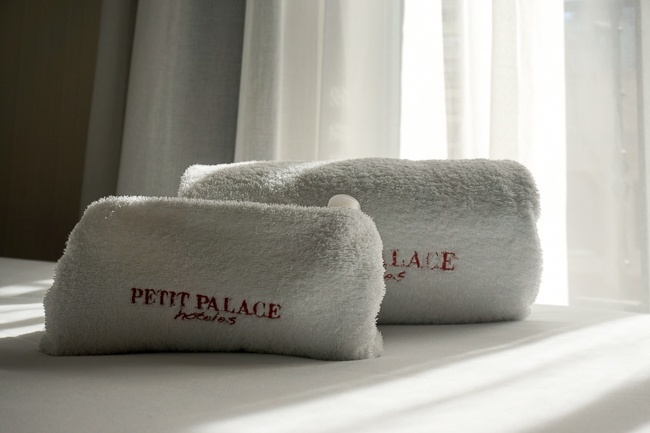 | Book a Madrid hotel now. 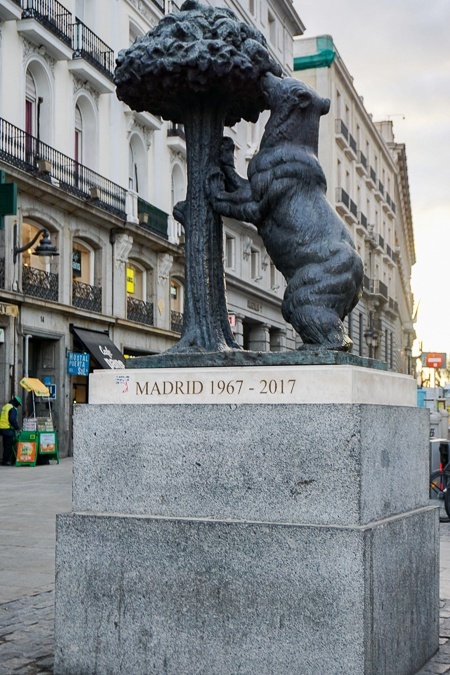 Puerta del Sol is the heart of the city, with Calle Mayor running alongside it on one side and the Gran Via in short walking distance on the other side. The large open plaza has a metro station and a taxi queue, along with a lot of people. If you’re staying in this area, it’ll feel like you’ve been dropped into a smaller version of Times Square, minus the neon lights. You’re actually at kilometer 0, the most central square in Spain. This makes Puerta del Sol your north star in Madrid. Use it to orient yourself as you navigate to and from Madrid’s top sights. 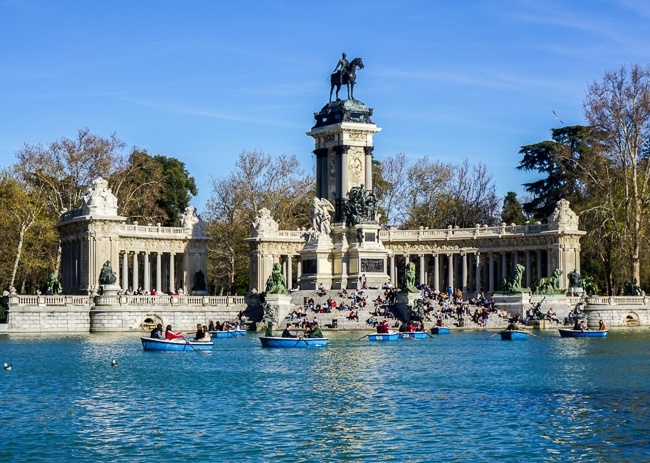 Walk about 15 minutes or so to the east and you’ll find Retiro Park and the Paseo del Prado, home to Madrid’s 3 most famous museums. 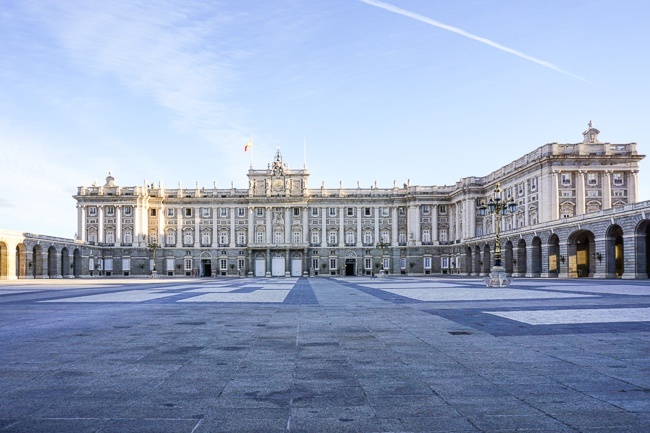 Or walk about the same time to the west out of Puerta del Sol and discover Mercado de San Miguel and the Palacio Real de Madrid, the city’s Royal Palace. Before heading off to begin your three days in Madrid, use the energy of the square to shake off any jet lag you might be feeling. 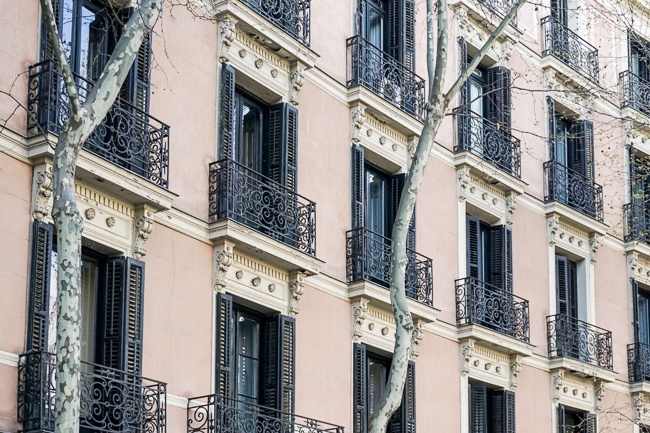 Get your first glimpses of Madrid’s classic architecture. Take stock of the many pedestrian-friendly streets and alleyways stemming off into a thicket of shops and cafes. Lastly, be sure to grab a photo next to the Statue of the Bear and the Strawberry Tree. It’s part of Madrid’s coat of arms and a symbol of the city. Start your day by setting off from Puerta del Sol, eastward to the Museo Nacional del Prado, or the Prado Museum. The museum houses some of the world’s most famous classical European paintings from the 12th century onward. Works by Raphael, Caravaggio, Goya, Bosch, and Velequez steal the spotlight. The Prado Museum is on several levels but it never felt overwhelming in the way a huge museum like the Louvre can. Still, as with any large art museum, all but the most diehard of art fans should plan to spend no more than a couple of hours seeing select paintings before fatigue sets in. The best strategy is to choose some paintings you’d like to see beforehand and focus on these during your visit. A few of my favorites were Bosch’s Garden of Earthly Delights, the Portrait of the Cardinal by Raphael, and the Clothed and Naked Maja paintings by Goya. Plan to arrive when the museum first opens, both to avoid the largest crowds and while you’re still fresh in the day with the most energy. I booked these skip-the-line tickets ahead of time. There was a small queue for those of us with tickets already, but we entered the museum quickly with our own dedicated security entrance versus those who had to first wait in line to buy tickets and then proceed through museum security. 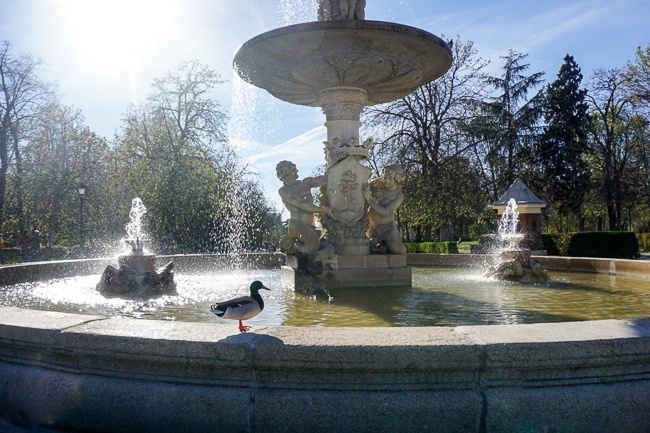 When you’re ready to stretch your legs and get out into the Madrid sunshine, walk just a few minutes to Retiro Park. All classic cities need green space to escape the crowds and commotion of the city streets. Madrid’s version offers wide open walkways for casual strolls and a pond where visitors can paddle a rowboat out onto the water. If your walk amongst the statues of former Kings has you feeling like one of Spain’s nobility, it’s because the park once belonged to Spain’s royal family. 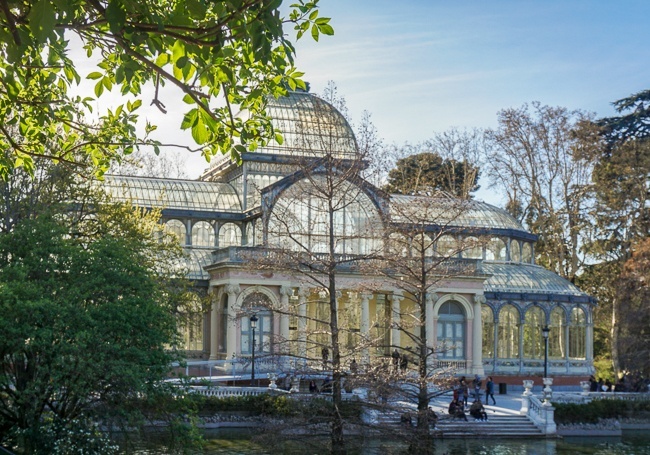 Before rejoining the current of Madrid, be sure to see the Crystal Palace tucked amongst larger-than-life evergreen trees and alongside a duck and turtle pond. If you visit in the spring and summer, walk through the rose gardens, too, which are just a couple of minutes from the Crystal Palace. The park has public restrooms (although bring your own toilet paper ladies) and a few cafes if you’d rather grab a coffee and just people watch. 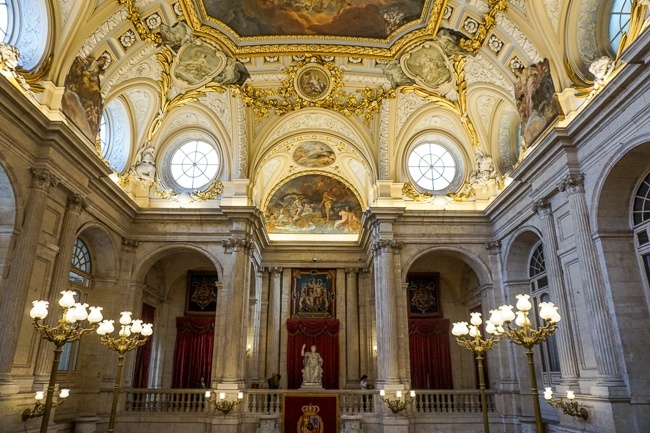 For the afternoon, and given your location in the city, it makes sense to choose from some of Madrid’s other popular museums. You can also explore the city’s architecture itself as a work of art if you prefer. The Museo Nacional Centro de Arte Reina Sofia or the Reina Sofia Museum is Madrid’s museum for 20th-century art and contemporary art. The museum has collections by famous Spanish artists like Dali, Picasso, and Miro, to name a few, as well as numerous other works from non-Spanish artists. The Museo Nacional Thyssen-Bornemisza completes the 3rd museum in Madrid’s triangle of art. The museum has hundreds of works from the 13th-century up through pop art of the late 20th-century. The collection was once owned by a single wealthy, art-loving family, which is remarkable considering the depth of the collection and how it has works of art spanning centuries of different periods of art. If you’re an art lover looking for a quieter place than the Prado to enjoy Madrid’s art scene, the Thyssen-Bornemisza makes an excellent choice. If you’d like to visit all 3 of Madrid’s top museums, a combination ticket will help you save money and skip-the-line at each one. 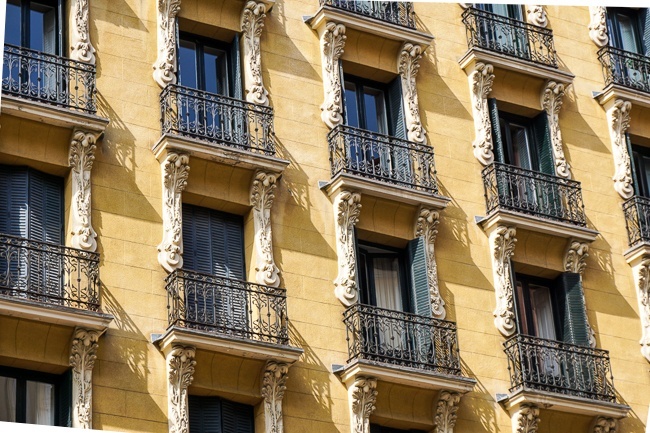 Or if you’d rather be out in the Madrid sunshine, go in search of city’s classic architecture. You’ll have already glimpsed some of Madrid’s style in Retiro Park but circle back if you missed it. The Plaza de Cibeles lies in one of the Paseo del Prado’s roundabouts with its Belle Epoque style palace. 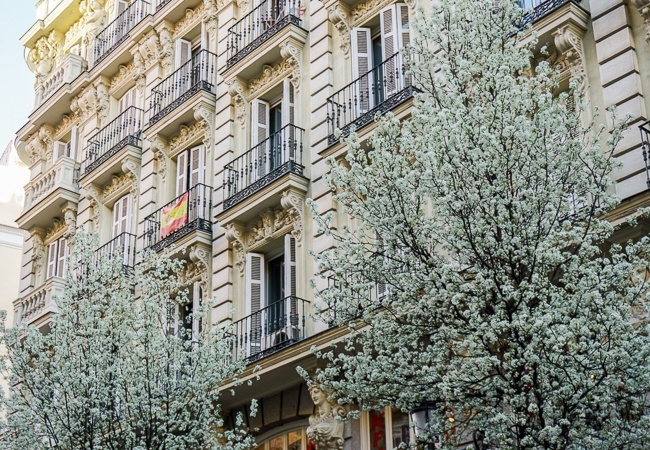 Just north of Retiro Park, wander along Calle Velazquez and the neighboring streets to discover some off-the-beaten-path Madrid architectural gems. 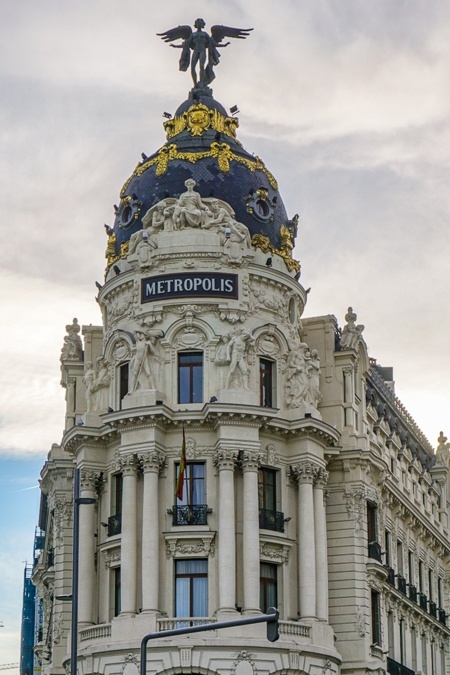 On the way back toward the Puerta del Sol area, walk along the Gran Via which literally translates to “Great Way” but would more appropriately be named the Great Way of one beautiful building after the next! Yes, there are shops, restaurants, and theaters, but the art deco and art nouveau style of the buildings will be what fills your camera’s memory card. ProTip: If you’d like to take a few birds-eye view photos of Madrid, make a stop at El Corte Ingles Gourmet Experience, just off the Gran Via. Take the elevator to the top floor for city views and gourmet souvenirs. Aside from the optional shopping, it’s one of the best free things to do in Madrid. After a successful first day, are you wondering what things to do in Madrid at night? After all, Spain comes alive at night especially around delicious food and drink! If you’re searching for the best tapas in Madrid, you’ll have no shortage of places to try. But, the Mercado San Miguel, a food lover’s market open from 10 a.m.-12 a.m. (1 a.m. on weekends), is a great place to start. Expect it to be busy but well worth the time and extra Euros spent to enjoy the food and atmosphere. 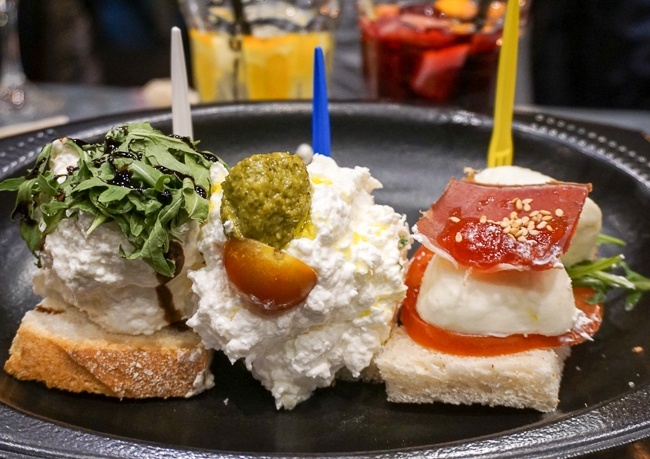 If it’s your first time in Spain, Mercado San Miguel is a great place to try a sampling of foods and to get to know a little of the country’s tapas culture. The idea is to walk through the aisles as you taste small tapas bites and sip drinks from the vendors lining the market. 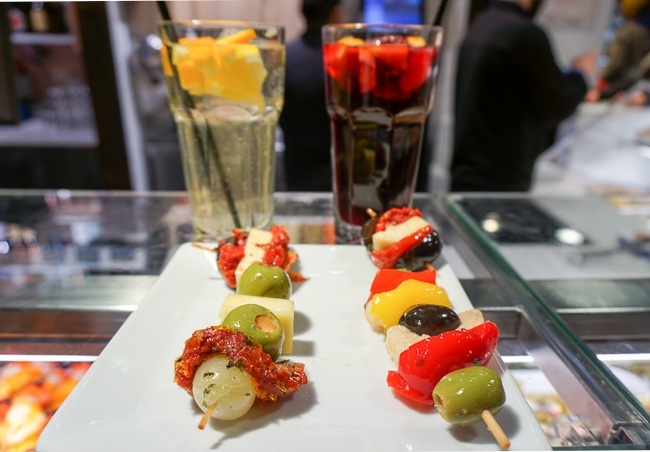 Your list of what to see in Madrid in 3 days must include a stop at Mercado San Miguel. Tables and stools are set up at the center of the market if you’re lucky enough to find a few empty seats. Remember, it’s as much about the vibe as it is the food! I tasted everything from cod croquettes to empanadas to olive skewers and burrata toasts and visited more than once during my time in Madrid. When asking what to do in Madrid for 3 days, no itinerary would be complete without a day trip outside of the city. 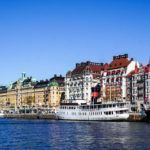 The tough part comes when you have to choose between several top historic and cultural places! Without a doubt, Toledo and Segovia are the two most popular Madrid day tours, although there are others, as well as possible combination trips. Toledo, Spain dates back to Roman times and has been named a UNESCO World Heritage Site. Charles V, Emperor of the Roman Empire held court there. The city’s long history has influences dating back thousands of years including cultural landmarks from all three major religions. In addition to its history and well-preserved sights, Toledo is an hour away from Madrid by bus and just 30 minutes by high-speed train. 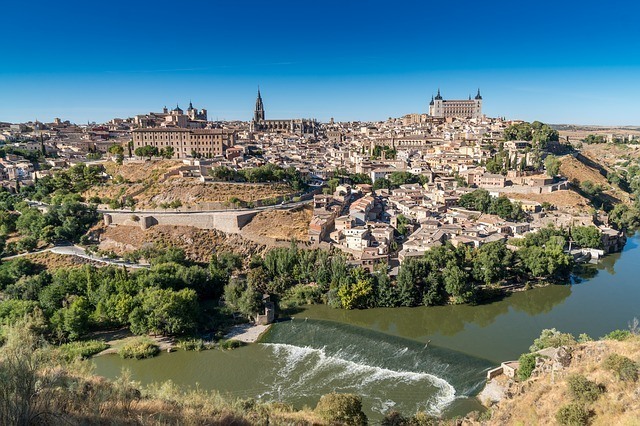 You can also book Toledo day trips that offer guides and hassle-free transportation. There’s enough to see and do in Toledo itself. I’d recommend dedicating the day here, rather than split your time among Toledo and another central Spain stop. However, I understand time is a premium on vacation and seeing both Toledo and Segovia is tempting! Segovia has also been recognized by UNESCO. 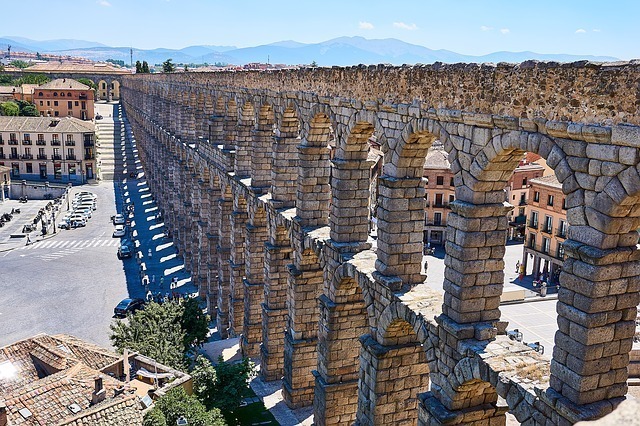 It’s most famous landmark is a Roman Aqueduct likely built sometime between 1-50 A.D, after the Romans conquered what is now present-day Segovia. It’s one of the most popular places to visit near Madrid. Looking at the Aqueduct, it’s incredible to realize the Romans used no mortar or cement to hold the structure together! The stones and arches are perfectly balanced in such a way that has allowed for the Aqueduct to last thousands of years. Segovia’s Gothic Cathedral and Alcazar are also noteworthy sights to see during your visit. The Alcazar was built in the Middle Ages and blends a variety of architectural styles. Similar to Toledo, wandering around Segovia’s old town reveals the influences of the Christians, Moors, and Jews who lived and worked together for hundreds of years. Segovia is also just an hour from Madrid by bus and only 30 minutes by high-speed train. If you’ve rented a car or are part of a tour, it’s possible to combine Segovia with a stop in Avila by focusing on just the main sights in each town. 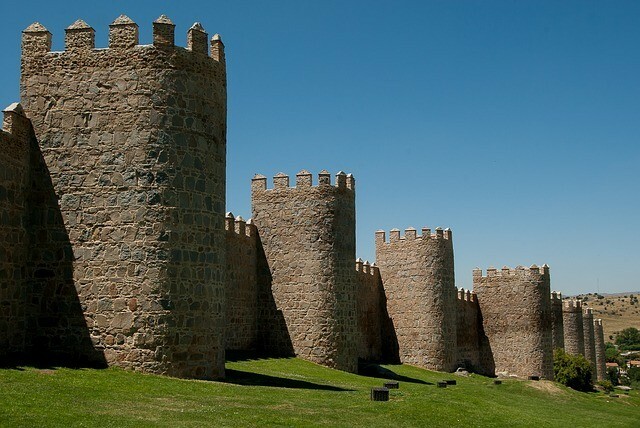 Avila is known for its medieval walls which surround the town. They were built in the 11th-century and are in remarkable shape considering the battles and elements they’ve weathered. There’s also a Cathedral which was built into the medieval walls. 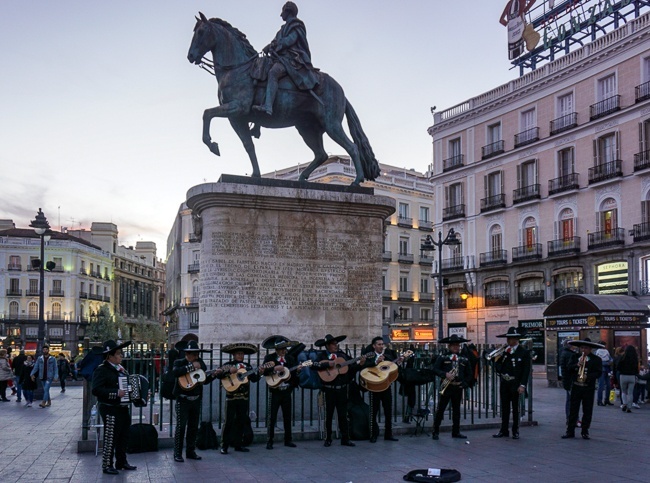 After a day spent outside the city, return to Madrid and immerse yourself into Madrid’s nightlife with a flamenco show and afterward the tapas scene in Barrio La Latina. Barrio La Latina is one of the oldest areas in the city and it’s known for its local vibe and buzzing nightlife. The tapas bars and restaurants on Calle Cava Bajas line the street serving authentic Spanish food from snacks to meals! A perfect way to end another unforgettable day in Madrid. ProTip: If your visit to Madrid coincides with a Sunday, El Rastro is a huge outdoor flea market held in Barrio La Latina. It’s THE place to browse, people watch, and maybe come away with that one-of-kind gift or souvenir. Today, from the Puerta del Sol area head west along Calle Mayor, eventually turning left onto any number of side streets that’ll lead you to Plaza Mayor. This wide-open square, reminiscent of the kind found throughout many European cities, dates back to the 1400s when it was Madrid’s central market square. Throughout the years, fires have damaged the square creating the need for more than one rebuilding of the square. The buildings and design of the square you see today was constructed mainly in the 1800s. Touristy cafes line the perimeter, hawkers sell trinkets, and a monument from the 1600s of King Philip III is the focal point at the center. If you’re feeling hungry, resist the urge to sit in the square. 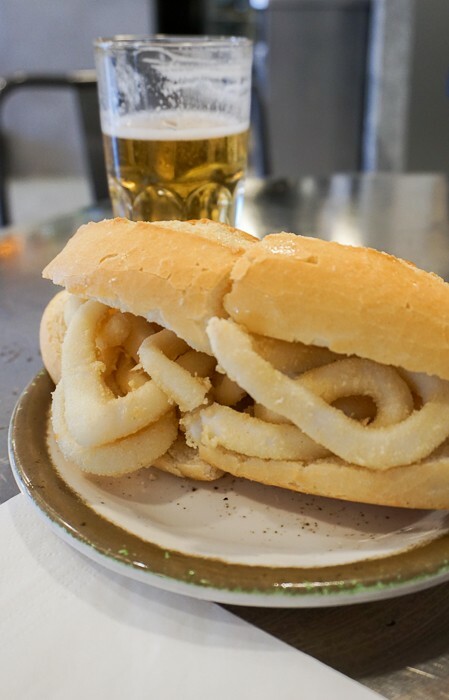 Instead, grab a Bocadillos de Calamares (a calamari sandwich) from 1 of a few hidden gems around Plaza Mayor. Bar Postas and La Campana are both hiding in plain sight on side streets near Plaza Mayor serving up these delicious Madrid specialties. Not to mention, the Mercado San Miguel and Sobrino de Botin, Madrid’s and the world’s oldest restaurant, are just steps away from Plaza Mayor, too! 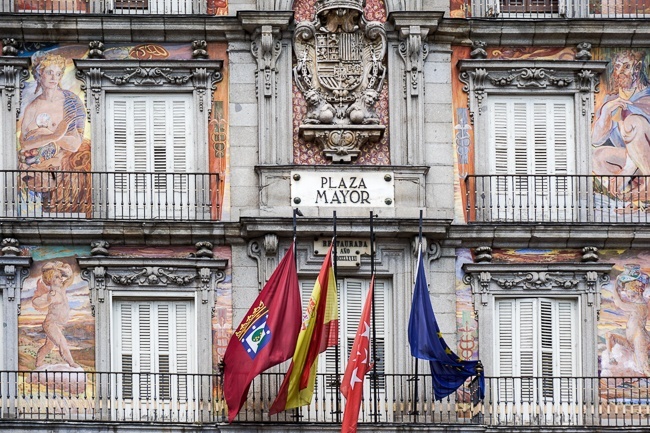 Depending on the entry time reserved on your Royal Palace of Madrid tickets, you may want to bypass the Plaza Mayor area and return for lunch or dinner bites…or both! The Palacio Real de Madrid, or Royal Palace, is at the end of Calle Mayor and just a couple of minutes to the right. You’ll see the Almudena Cathedral on the corner, which is next door to the Palace. Again, tickets bought in advance helped us skip the line and go right through security at our selected entry time. There are also different types of visits from early access to Royal Palace guided tours with expert guides. Once inside the palace grounds, you can tour some of the Palace’s 3,100+ rooms(!) starting with the grand staircase leading upstairs to rooms adorned with silk embroidered walls, crystal chandeliers, frescoed ceilings, gold trim, and a grand banquet hall still used by the current King and Queen for State dinners. The Palace also has a chapel, an armory room, and depending on when you visit, rotating exhibitions. Just in front of the Palace, sits the Cathedral Almudena. You can go inside the Cathedral which is complete with towering marble pillars, flying buttresses, and a magnificent pipe organ. However, since the original Cathedral was destroyed by a fire and this one was rebuilt in the early 1900s, the decor does have a modern feel, especially if you’ve seen other cathedrals throughout Europe. The admission is free (donations accepted, however) so the Cathedral is certainly worth a look. ProTip: The Cathedral’s open courtyard in front of the Palace’s wrought iron gate is the best spot to take a photo of the Royal Palace. Climb the side steps of the Cathedral for a direct look at the Palace facade. When you’re finished with the Royal Palace, walk to see the former monarch statues lining the gardens in the Plaza de Oriente and just beyond that the Plaza de Espana and the Temple of Debod. Along the way, you’ll also pass gardens which were once part of the grounds of the Royal Palace. 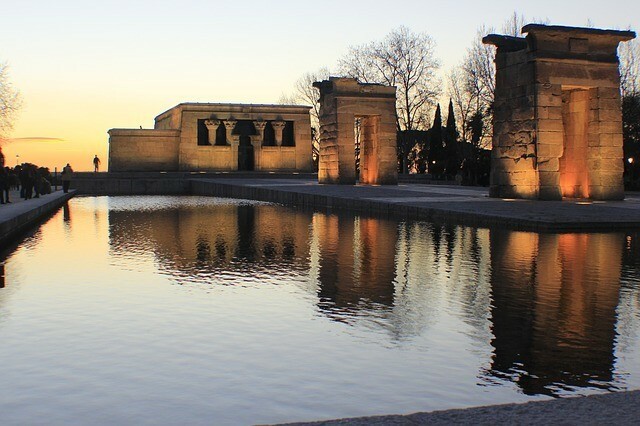 The Temple of Debod is an actual Egyptian Temple given to Spain. which once sat in the south of Egypt. Visitors can enter inside and walk through the arches out in front. Unfortunately, when I visited, it wasn’t as pretty as above because the water pools surrounding the Temple had not yet been filled. Perched up higher than other parts of the city, the park in which the Temple of Debod sits also makes a great sunset location, especially when the pools of water reflect the fading light from the sky. You can also get photos that overlook the city back towards the Royal Palace. 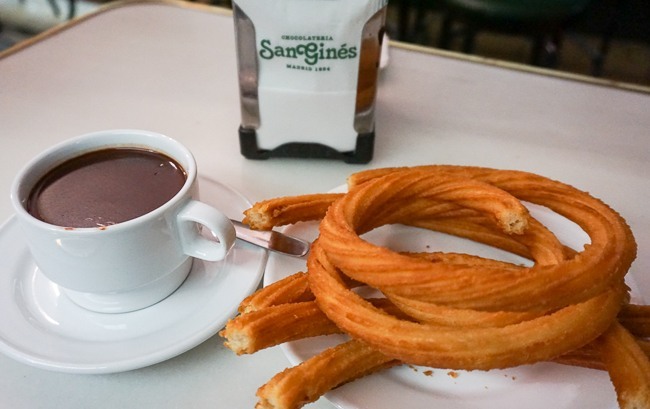 After 3 days in Madrid, head back toward the city center and reward yourself with the treasure of San Gines, located just off the Calle del Arenal near the Puerta del Sol. The chocolatier is the oldest in Madrid, dating back to 1894. Go for the famous churros dipped in a mug full of thick chocolate heaven. How many days in Madrid do you need? How many days to spend in Madrid depends on what you’d like to do. As with any big city, it’s impossible to see everything in just a few days. 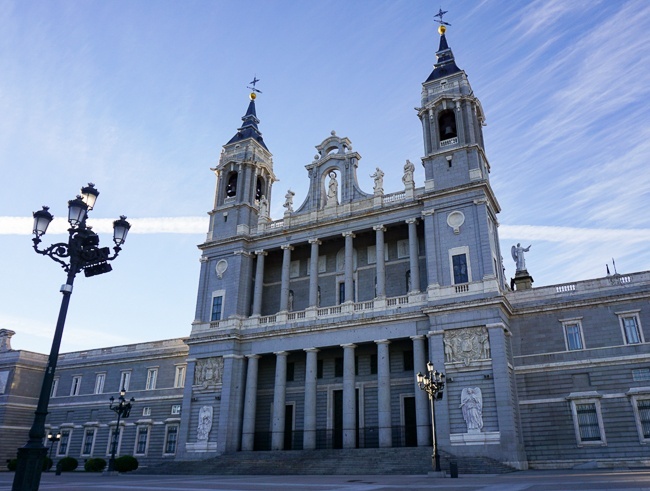 But a 3 day Madrid itinerary provides just the right amount of time to see the main sights and museums, while still leaving open the option of doing one of the popular Madrid day trips to places like Toledo or Segovia. If Madrid is the first stop on your Spain itinerary, I recommend planning the transfer to your next destination in the evening. This way, you can enjoy your 3rd and final day in Madrid and then make your way to the train station or airport. I took a 7:30 p.m. train to Barcelona and made it to my hotel with enough time to enjoy some tapas before going to bed. Where to next in Spain? Madrid to Barcelona or Madrid to Seville is just about 2 1/2 hours by high-speed train. Madrid’s Atocha Station makes it quick and effortless to transfer between Madrid and other cities in Spain. It’s less than 2 miles from Puerta del Sol or about 10-15 minutes (depending on traffic) by taxi to the station. Even better than its location, Atocha station has a tropical green atrium with giant palms filling the open space of center atrium. It’s actually a sight to see aside from any train travel. Just remember, you do have to pass through security to reach the train gates, so be sure to leave yourself enough time to see the station and get to your train on time. Trains in Spain require an assigned coach and seat number. Popular routes and times, especially during peak seasons can sell out so buy your tickets ahead of time. Depending on the train, the schedule opens up 2-3 months before your travel dates. I used Loco2 to book my tickets because it has all of the available trains listed as Spain’s train website, but the website is in English, allows you to print out your tickets ahead of time, and isn’t glitchy with credit cards. Is Madrid worth visiting?! Of course! It’s one of the most visited cities in Europe and adds charm and authenticity to your Spain itinerary. 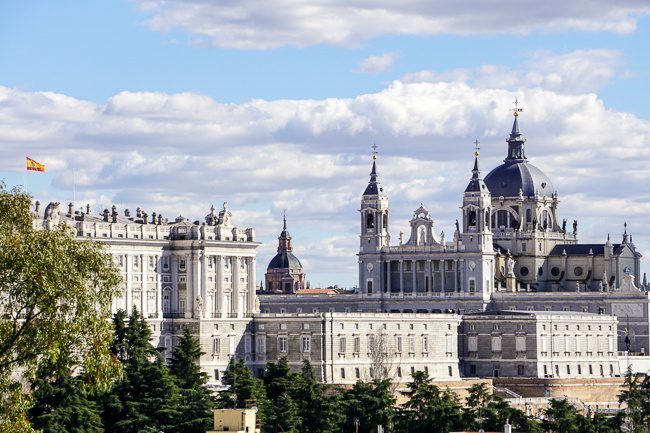 With three days in Madrid, you’re sure to fall in love with the city’s sights, food, and architecture. What would you like to see and do during your 3 days in Madrid? Like this post? Please share it on social media using the share buttons below. 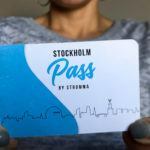 Is the Stockholm Pass Worth It? 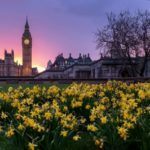 All photos and content are copyrighted and belong to Jackie at The Globetrotting Teacher unless otherwise cited. 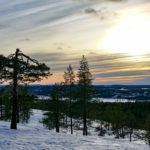 The photos and content on The Globetrotting Teacher may not be reproduced or used elsewhere without permission.